Before we show you the endings, let's set the stage for this game for those who don't know. Basically, the setting is rural Montana. A very David-Koresh-like doomsday religious cult leader is charged with kidnapping and the local sheriff is tasked to arrest him... this process causes the cult to activate into a paramilitary group, that takes over three regions on the game map, that you're tasked with liberating. The group also is cultivating some kind of drug that is used to control and brainwash people. You play one of the "good" guys, who is with the local law enforcement, but at some point you're captured, given drugs and brainwashed into being a killing machine that is activated by a certain song. The game is composed of a variety of missions where you wander around the map killing everything in sight, including tons of wild animals that apparently have all become rabid due to foraging on these cult drug flowers. Far Cry 5 is one of those GTA-like games where you can wander around on the map and explore, and there's much to see and do and the terrain is quite beautiful. You complete missions to earn things and become stronger and more powerful. You collect weapons and various items as is common in these games. The question is, how far can you go in these games before it might be worthwhile to argue over the value of certain narratives being promoted? You can decide... 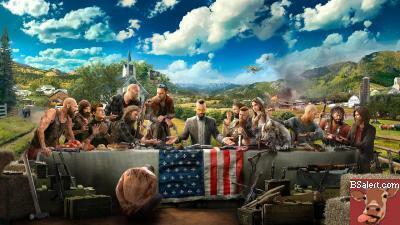 In an age where we have rampant domestic terrorism that seems similarly modeled after the ideology of characters in this series, it has to make you wonder what the developers were thinking? There are 3 endings in the video below.. the first and the third happen at the end of the game. The middle one happens at the beginning of the game. 1. At the end of the game, after liberating 2 of the 3 regions, you confront the head of the cult. He gives you a chance to walk away like he did in the beginning. You can choose to walk away or resist. 2. At the end of the game, you choose to continue to resist the cult leader. 3. A the beginning of the game, you can end the game in the first few minutes by choosing not to arrest the cult leader. If you walk away, the credits roll... this ironically, is the most moral and socially palatable ending of the three. The second option is the most likely, and it shows you a rather bizarre outcome that ultimately has to make you wonder, WTF is up with the developers?